My husband and I have managed to raise three awesome kids. Those teen years can be rough and, although we aren’t perfect, we came away with very few battle scars. Below are 26 thoughts and ideas for you to consider. Accept their strange clothes and hair. This is their time to explore and create their own identity and style. As long as they aren’t breaking dress code rules or family modesty rules, let them experiment. You might just have a future designer and trend setting on your hands. Be there 100%. When you accepted the role of parenting, that included the teenage years. These are years when the kids aren’t quite so cute. Show up emotionally and physically. Seeing your child to adulthood will be one of your greatest accomplishments one day. Change happens, sometimes daily or even hourly. Girls have dramatic breakdowns and boy have anger surges. Be prepared for change and then be prepared for things to change back. You won’t often know why and probably don’t need to. Develop a friendship. Teens need rules and boundaries. They also need people they can lean on during hard times and a confidant when they need advice. 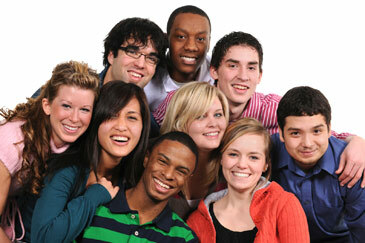 If you develop a friendship during the teen decade, it will continue to grow. And when they move out onto their own, which is sooner than you can imagine, this friendship will be really important. Enjoy these years. Okay…that may sound like an oxy-moron, but really. You are witnessing a human evolve from a child who once needed you for everyday care into someone who is self-sufficient and independent. It’s pretty amazing! Find the fun in the journey. Do you like chick flicks? If its age appropriate, your teenage daughter might love having a mom-daughter movie night. If you are a sports fan, take your son to baseball games during the season (even if it’s in the cheap seats). Scheduling and planning “fun” time will build memories that will last a lifetime for both you and your child. Get advice from other parents. You are not alone and trust me, as much as you scratch your head or cry in frustration, there are ten other parents close by who are doing the same thing. Getting ideas from friends who are parenting kids the same age as yours will give you hope. There is strength in numbers! Honesty is really the best policy. So, how do you convince your teen to tell you the truth? Don’t freak out when they do exactly what you asked. If they share something personal or important and you immediately dive in with criticism or opinionated commentary, you will condition them not to make that mistake twice. Teens act on impulse and change their minds often. This is part of growing up and making decisions. If you want honesty, learn to listen with the intent to really hear. Invite their friends to your house. Make your home a “fun zone” because if it becomes the place where you kids’ friends feel welcome, you will have more control over their activities and safety. One way your kids will feel comfortable inviting their friends over, is if they don’t hear criticism about those friends from you. As long as house rules are followed, let those kids be themselves without judgment. People flock to where they are accepted. Join in the activities they enjoy. If your son loves scary movies and you don’t, watch one with him anyway. If she likes to shoot a basketball in the driveway hoop, join her. Gone are the days when your child will run to you, sit on your lap and let you read them a story. Now you need to go where they are and join them. Keep rules and expectations known. This suggestion goes along with setting appropriate boundaries of behavior. If your kids know the rules up front and knows that their parents are going to expect certain things, this might minimize arguments later. Everything from alcohol use (or non-use, hopefully) to dating rules should be discussed long before your child even thinks about crossing any lines of behavior. Once the peer pressure hits them, it might be too late. Your child should know your expectations early. Let them grow up and then let them go. Adolescence is challenging for parents because there is a natural process of breaking away. It’s painful when your child doesn’t really need you. In fact, if it seems like your kid only wants you for a roof over his head, food and clothing then you can be pretty certain that he is a teenager and he is acting “normal”. But don’t worry. They will come back and need you again. It won’t ever be the same as when they were little. It might actually be better. Mistakes happen. Ignore the minor ones and coach them through big ones. When you were a kid, did you know when you made a mistake? I did. It didn’t help when my parents ranted on and on about how I messed up. For a major screw up, some coaching and advice is necessary. But let the little things go. Organize your thoughts before crucial conversations. Cool down when you’re angry and take a long break before approaching a problem that needs discussion and discipline. Be firm, be consistent and be calm. Praise the good. Find at least three positive things to compliment your teenager on every day. To avoid sounding ridiculous and repetitive, you will have to really start noticing even the little things. But all those little compliments will add up to a whole lot of love being showered on your kid. It will feed their confidence and make a huge difference in their life. Quick to admit fault. Sometimes we blurt things out and before the sentence has even finished leaving our lips, we know it was the wrong thing to say. That’s the perfect opportunity to tell your child, “Oh…you know what? I didn’t mean to say that. It came out wrong. I’m sorry.” Nothing makes your teenager listen to you quicker than when you humble yourself and admit your own faults. Recognizing the difference between anger and fear in your child may help you both. Believe it or not, these emotions are often exhibited in similar ways. Loud outburts, frustration, irritation and avoidance might make you think your child is angry, when, in fact, they are afraid of something. Think about this and notice the next time you think you are seeing anger. It might not be anger after all and could be an opportunity to talk your child through some feelings. Stay in your own lane. I love the analogy of two cars driving side by side down the road of life. You are driving one car, your child is driving the other. (This is especially appropriate for older teens who are almost young adults.) While driving in your car, you might see a large bump ahead in their “road” and it’s appropriate to honk your horn to warn them. It’s even okay to make a large road sign, giving important words of advice and post that sign right where they will be certain to notice it. But ultimately, in the end, we need to trust that through this thing called parenting, we have taught them to steer, brake and accelerate their own car in the lane of life and we must stay in our own lane. Touch is crucial for development and happiness. Several studies have shown this to be true. So, hug your teenager often! Every child is different. I have one daughter who hugged me all the time during adolescence. It strengthened her sense of support from me. My other daughter isn’t very touchy but I still hug her. Sometimes, it’s more like what I call a “hi-jacking hug” which is actually me just tackling her for 30 seconds. However, it brings a smile to her face, so I always consider it a successful mission. Unconditional love might seem self-explanatory, but a lot of kids feel like their parents are only proud of them “IF”. IF they get good grades, IF they have friends who fit a certain mold, etc. When really, don’t we want them to know we love them and are proud of them with no strings attached? It’s the same way everyone wants to be loved — just because we are who we are. Validate feelings. Most of the time, people don’t want you to fix their problems or even give them advice. They just want to be validated and understood. Using phrases like, “It sounds like you had a frustrating day” or “Do you have any ideas how to fix this problem?” and “Wow…that is tough. What are you going to do?” will confirm that you are really listening and will help them problem solve and come up with solutions to the trouble life throws at them. When you notice your child start to change (puberty hits, emotions seem to fluctuate often, etc.) that is when it’s time to change your parenting. The tricks you had up your sleeve for your nine-year old daughter won’t work when she’s fourteen. There are thousands of books and websites just waiting to give you advice. I have read many, MANY books on parenting. I don’t agree with everything I read. But I take away what feels right for me and my family, I implement new ideas and sometimes they work! Be open to learning new ways to be Mom or Dad. eXamine your own behavior before you expect perfection from your children. Do you lie? Even little white ones? How often do you gossip with your friends? Are you always able to keep your temper under control? Do you have the best manners? Do you drive at or under the speed limit at all times? Have you ever been careless? Ya…I’m not perfect either. I certainly cannot expect my child to be. Youth only comes once. So, even though you might be tempted to live vicariously through your teenager’s life by becoming emotionally involved in friendships and even love interests, resist the urge. It’s really not your place…or your time. Zip your mouth more often than you think you should. You will learn much more about your child if you just listen. I cannot stress this enough. There is a time for lecturing or correcting (but not much time, ha ha). You’ll gain their trust and respect by NOT talking. Besides, sometimes an ‘evil eye’ goes further than a lecture. ** Special thanks to my husband and incredible parenting partner for helping me write this post! Great tips and tricks and food for thought up there! I’m a big believer that my son should be able to enjoy his teenage years, but he’s decided he wants to graduate early, so now I have to support him having so very little free time! It’s not always easy, but it is his journey to take and all I can do is off up suggestions about the path, in the end, he has to walk it, I can’t walk it for him!